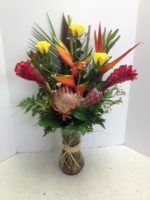 This amazing floral arrangement is designed with Hawaiian flowers, which are delivered fresh to our shop 3 times a week. 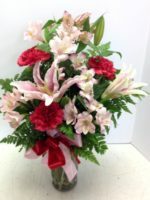 The assortment varies according to availability, but the arrangement will be similar in style to this one. 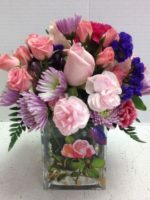 The white roses make this arrangement “pop”! 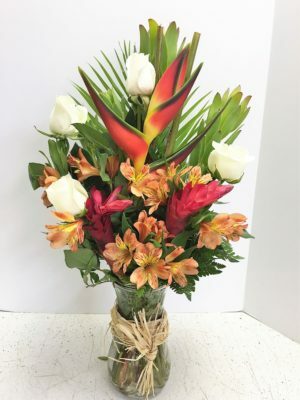 We designed this beautiful tropical arrangement for the Arizona Biltmore hotel, and we’re honored to give it that name. In case you don’t know, the Biltmore is an Arizona landmark, which has offered world class dining, events and golf since 1929. You can read the history of this amazing hotel, including the Frank Lloyd Wright architecture, by visiting this website offered by the hotel. 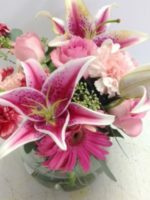 Perfect for an anniversary or birthday, this beautiful arrangement is appropriate for a get well or congratulations as well. Other options for you include the Marvelous Michelle and Paradise Found.